All the Kimberley Maps you'll ever need are on this page. I'll also show you the best road map of the Kimberley in Australia. It's the most detailed and the most accurate map of the Kimberley that's available. The Kimberley map that I recommend is produced by HEMA. It's the best map of the Kimberley for tourists, period. This is not just a personal preference of mine. The HEMA Kimberley map is the map that you see laminated and glued to the desk of every tourist information centre in the Kimberley. Why? Because it's the map that best helps the people behind the desk answer your questions. Highlights all the attractions, reserves, national parks etc, and gives you a short description of what there is to see and do. There is also a lot of important travel information, for example about the quarantine at the WA border. Everything you need to know. Shows exactly what services are available at the remote roadhouses, stores and wilderness camps. Lists phone numbers for wilderness camps, tour operators, national park offices, shire offices, main roads offices and other government departments, anything you could need on your trip. On the back you have a larger scale map of just the Gibb River Road, again with explanations of all the sights along the way. And on top of all that you get a bunch of beautiful pictures of the Kimberley and a short travel guide for the region. 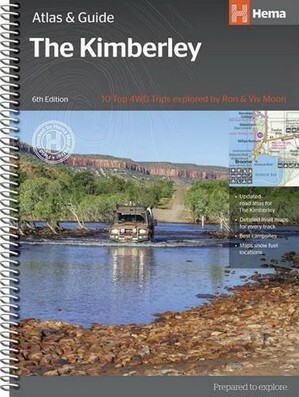 The HEMA Kimberley map is an excellent Kimberley map and a great picture travel guide all in one. It's a must have map, unless, of course, you have the HEMA Kimberley Atlas & Guide! You might also want to look at Gibb River Road Maps.